NOW AVAILABLE AT PRE-LOCK SECURITY SERVICES!!! Reinforces the door frame with the enlarged strike plate. Clean lines, unobtrusive and physically appealing with no mechanical parts. Easy to install on both new construction door units and on existing doors. The single most important means of protective security is hardening the target. If break-and enter artists were a business and they were pooled together, they would operate one of the most lucrative business in Canada. In Ontario alone, insurance companies paid out over $100 million for items lost during residential burglaries. 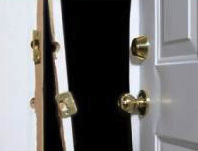 Did you know that 90% of all forced entry break-in's are through a door. Did you know that most are also 70% are through the front door? There is no price you can put on the homeowner's feeling of fear and uneasiness, of violation and anger that is always caused by a break-in. Improving the resistance to forced entry is what we are all about. If we can prevent a crime before it occurs with very little effort then there is no reason for not doing so. The problem with forced entry is it can take a few seconds to at the most a few minutes. Believe it or not it can take you longer to enter your home with a key than it does for a burglar. 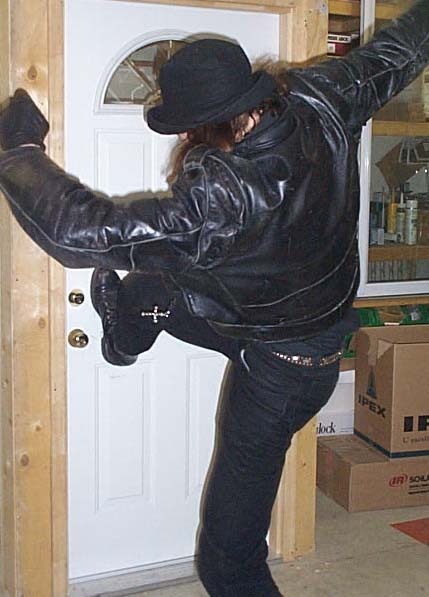 A burglar with one forceful, well placed kick, can break open the average door with no tools!! Don't think it can't happen to you. We are now ready for action when we install & supply a simple device that will reduce forced entry intrusion. Ask us about our new Door Reinforcement System now available at Pre-Lock that should be installed on all exterior doors of your home. We believe the installation of high security door locks like Medeco High Security products & Mul-T-Lock High Security Products coupled with products designed to strengthen the door and frame will eliminate the odds of be burglarized entirely from that point of entry strictly due to the delay typically encountered for the intruder when they start the attack. The delay increases the burglar's exposure to getting caught. The longer he is lurking around your home trying to get in, the greater the odds some neighbour or bystander will detect him. The delay also causes the intruder to feel that perhaps detection is inevitable and will cause them to leave. The Safe Door System is a means of reinforcing your doors, frames and locks that increases the security of your home and business against burglary typically acomplished froom one kick. Independent tests prove a tenfold increase in the strength of your doors after adding only a Door Safe. The Door Safe System sports clean lines and no mechanical parts to wear out The Safe does not change the look of your door making it unobtrusive and is physically appealing. It can even be painted to match your existing door, becoming virtually invisible if you don't like white or stainlless steel. The Federal bureau of Investigation reports of the burglaries for which the time could be established, most (62.2 percent) residential burglaries occurred during the day, from 6 a.m. to 6 p.m. Nonresidential structures were targeted more often at night with 58.0 percent of these offenses occurring from 6 p.m. to 6 a.m. In the united statesThe average dollar loss per burglary offense was $1,642. Losses from residential burglaries averaged $1,607 per offense and losses from nonresidential burglaries averaged $1,708 per offense. The British Home Office statistics note that Successful offenders were slightly more likely to gain entry from the back of the dwelling (48%) than the front (44%). The most common point of entry in successful burglaries was through a door (70%). The average financial loss in a residential burglary is high. The actual emotional loss to the resident is much more severe. Feelings of violation, fear, outrage and of course loss of irreplaceable personal property and family heirlooms cannot be assigned a dollar value. Reinforcing your doors is one of the best steps you can take to protecting your home family and business. Below are a few tips that can reduce your exposure to having your door kicked in. While the average financial loss in a residential burglary is high. The actual emotional loss to the entire family is much more severe. Feelings of violation, fear, outrage and of course loss of irreplaceable personal property and family belongings cannot be assigned a dollar value. The reason for burglaries happening in the daytime is a lower risk of being easily spotted and a smaller chance of confrontation with the home owner. Most people are away from home in day time. THE REVOLUTIONARY DOOR SECURITY SYSTEM DRAMATICALLY REDUCES THE ABILITY OF THIEVES TO BREAK INTO YOUR HOME BY REINFORCING BOTH THE DOOR AND THE DOOR JAMB. email us at sales@pre-lock.com ask us about the Door Safe System® now in stock! !